This article will show how to send email alert from TCW241, TCW220, and TCW210-TH via Gmail. The settings for all three controllers are the same, so we will use the general name Controller in the article. To send emails via Gmail, of course, you need to have your own account. For successful e-mail sending, properly settings in following pages of the Controller should be made: Setup-> Networks, Setup->Time and Setup-> SMTP. In general, the settings here are standard for any device connected to an Ethernet network. However, we will focus on the availability of a valid Default gateway and DNS server. Lack of valid settings in these fields will not allow emails sending. We highly recommend using Google DNS Servers 8.8.8.8 or 8.8.4.4. By the way, the default DNS server’s address of Controller is 8.8.8.8. If you have any doubts here, please contact your ISP. Don’t forget to press “SAVE” before to exit. For most mail servers proper time settings are very important. An email with invalid timestamp may be rejected as a spam. Enter a valid public time server in the Time server field. 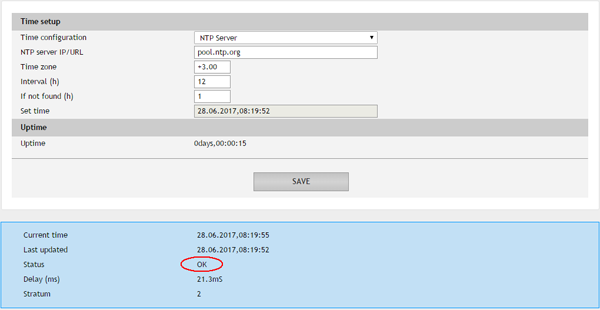 There are many free time servers, but we recommend pool.ntp.org. Valid DNS is mandatory when you use a domain name instead of IP addresses for the time server. Enter your time zone in Time zone field. For example, for GMT + 4:30 you should enter “+0430”. When you finish the settings, press the button “SAVE”. Pressing the button, saves your setting, but also initiates a connection with the time server and time update. This is important as a test for both – Network and Time settings. In the case of proper Network and Time settings, you will see “OK” for status and you can continue with Mail settings. If you see “ARP or DNS error” there is something wrong, therefore you should go back and check again Network and Time settings. For proper settings in this section, you should find the recommendations for the corresponding mail server. Here we talk about Gmail server settings. This is most easily done by searching for the key phrases “Gmail SMTP server settings”. At the time of writing this article, the valid link is https://support.google.com/a/answer/176600?hl=en. 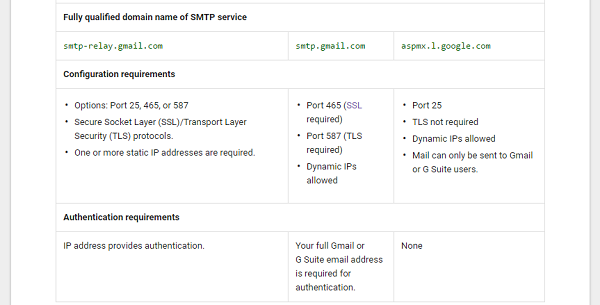 The correct setting for the “Mail Server IP / URL” field is smtp.gmail.com. It is possible to send an e-mail via Gmail without encryption, but this case is not the subject of this article. The correct setting for „Type of encrypted connection” field is TLS. And now comes the most complicated explanation setup. The complexity comes from not the same interpretation of SSL, TLS, and STARTLS. As a conclusion, Gmail uses SSL instead of TLS. Be careful with the terms of other mail servers. The right settings for Gmail for the field “Mail server port” is 465. In the fields “Sender e-mail” and “Username” fill in the full name of your account. For the purposes of visualization, we will use the standard sample account JohnSmith@gmail.com. In the “Password” field, fill in your password. So far, we’ve set up the sending section. The Controller can send alarm emails up to 5 recipients, but at least one must be present. 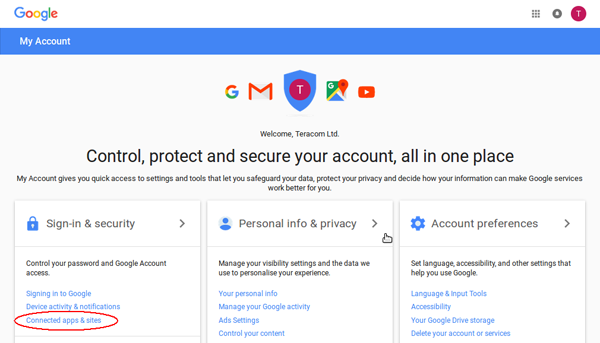 Place your Google account as a recipient for your tests. For the purposes of visualization, we will use the standard sample account JohnSmith@gmail.com. The e-mails are only sent to recipients which addresses are allowed by the checkbox. Some mail servers use restrictions for connected apps and sites. 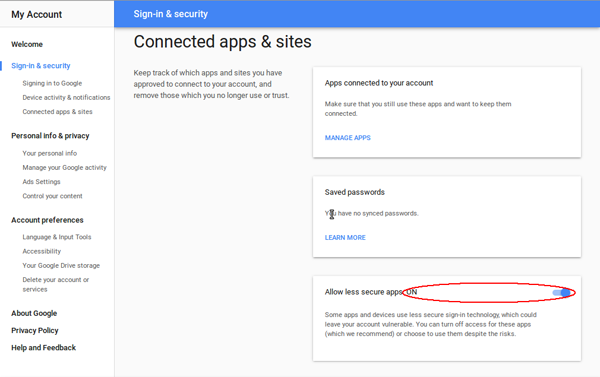 Switch “Allow less secure apps” to ON. If everything is done according to the instructions we can go to tests. The “Test server settings” button checks the validity of the server settings. Pressing this button sends a test mail to the sending account (e-mail address). After a few minutes, you should receive an e-mail in your account. 1. Could not establish TLS session – most probably wrong settings. 2. Could not connect to the server – most probably wrong settings. 3. Incorrect username/password or AUTH LOGIN is not supported. If the server tests are successful, you can switch to sending test emails to the recipients you entered. This is done by pressing the “Test email”. After a few minutes, all recipients should receive an e-mail in their accounts. Thank you for using Teracom products.